An arrogant, selfish, and enigmatic Archer-class Servant. He appears familiar with Fuyuki City and claims to have a past relationship with Saber. Typically clad in ​ornate golden armor, he possesses an immense number of Noble Phantasms, though none are representative of his true identity. Gilgamesh was initially summoned by Tokiomi Tōsaka in the 4th Holy Grail War, who used a fossil of the first skin ever shed by a snake as a catalyst. 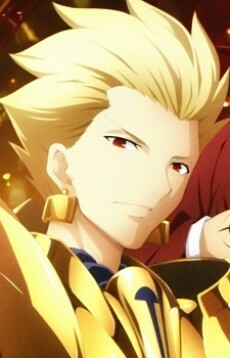 With Tōsaka's death, Gilgamesh participated with Kirei Kotomine to obtain the Holy Grail, intending to cleanse the world of humanity, which he felt had become corrupted and vile, thus not worth of his reign. When Kiritsugu Emiya killed his Master, Gilgamesh remained in the physical world long enough to be drenched by the pollution within the tainted Holy Grail. Contact with this ichor normally corrupts a Servant's ego, but Gilgamesh resisted submission to the evil influence. However, the saturation converted his spiritual body to one of flesh and blood, and Gilgamesh also become more eccentric and excitable. Noble Phantasms: Gate of Babylon - A small, plain sword that doubles as spatial key, allowing Gilgamesh to access his vast wealth contained within a vault in the heart of ancient Babylon. Inside this treasury are a myriad of Noble Phantasms collected during the peak of Uruk's civilization. Gilgamesh either throws these weapons or fires them out of his vault like rockets. In several instances, Gilgamesh has removed and normally wielded weapons. It is the hurling of these weapons that designate his class as an Archer. Several Noble Phantasms are of paramount importance: Merodach - A relatively unadorned but lustrous Noble Phantasm of immense magical power. Although not famous at all when compared to either of its descendants, the strength of Merodach as a Noble Phantasm exceeds either Gram or Caliburn. Durendal - This gleaming, holy sword is enchanted by three miracles, allowing its blade to never dull even when its user's Mana has been expended. Old legends call Durendal indestructible. Enkidu - One of the few relics Gilgamesh actually used during his lifetime, this chain was forged specifically to immobilize gods, albeit significantly less effective against opponents with little or no divinity. Ea (Enuma Elish) - A black, pillar-shaped sword, etched with fine crimson cuneiform letters. With an energy output that exceeds Excalibur, rotation of Ea's tri-blade segments vacuums and compresses surrounding atmospheric gasses. Upon release, the ensuing cataclysmic blast sunders the foundations of reality, causing a collapse of time and space that disintegrates everything around the area of attack. Ea's material components have no origins in the mortal plane; unlike other weapons, it cannot be replicated through tracing. It is the most powerful Noble Phantasm in Gilgamesh's arsenal. Vimana - mythical self-moving aerial car (sometimes serving as a seat or throne, sometimes self-moving and carrying its occupant through the air; other descriptions make the Vimana more like a house or palace, and one kind is said to be seven stories high.